Physical Description Tall, well-built Cardassian male. 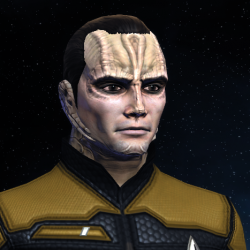 Hair often slicked back in the popular Cardassian style. As per the species, grey-skinned with facial bone ridges. Distinguishing features: Scar tissue on lower left side of neck from an engineering accident in his early twenties. General Overview Generally representative of Cardassian culture. Ibrim has a soft spot for art, literature and music that demonstrate the concepts of personal strength and dedication to duty. He is dedicated to the concepts of hierarchy and the chain of command, and he has problems with xenophobia due to his upbringing in the 'superiority' culture of the Cardassian Union. Ambitions - Command of his own vessel. - To set a shining personal example of the Cardassian species to others. Personal History Ibrim was born in 2359 on Cardassia Prime into a military family. As a youth, he was educated at a school run by the Cardassian Fourth Order and displayed a natural aptitude for mechanical & electrical engineering. In 2375, just three days after his sixteenth birthday, Ibrim was informed that he had been accepted to study Starship Engineering at the Cardassian Military Acadamy. However, the political turmoil of the year that ended the Dominion War resulted in the Academy suspending operations. Seeking a place to practice his engineering skills until the Academy re-opened, Ibrim arranged work in a shuttle repair shop in Larkarian City that was owned by a friend of his family. A twist of fortune meant that he was delayed travelling to the city because of the planetary turmoil, and so he was not killed when the Dominion levelled the city in retaliation for the actions of the Cardassian Liberation Front. In 2376, the Cardassian Military Academy re-opened, and Ibrim enlisted on his delayed engineering course. He graduated two years later, leaving the academy at 19 years of age with a certification in Starship Engineering. He was assigned to the Fourth Order as a Gil (Ensign) and posted upon the Galor-class cruiser 'Imtar'. The Cardassian Union was a fragile entity in the years immediately following the Dominion War, with political turmoil being commonplace in the power vacuum that followed the fall of the Dominion-dominated Cardassian government. An overstretched Cardassian military struggled to hold the Union together whilst policing the space lanes around their territory. The 'Imtar' was involved in several battles, mostly against raiders and pirates but occasionally coming to blows with the odd renegade Cardassian cruiser. Ibrim conducted himself with discipline and valor during these battles, earning himself several citations from his commanding officer, Gul Arkor. In 2386, Ibrim was demobilized from the Cardassian military at the age of 29 and the rank of Dalin (Lieutenant Commander). The military was struggling to rebuild its forces in the decade after the Dominion War, and a policy had been enacted for the compulsory retirement of officers out of the service after ten years. Ibrim appealed against the decision, but it was turned down. Ibrim did two years as a contracted engineer on starships for the Blue Star Cargo Service until he ended up in the Beta Quadrant at the end of his term of employment. He applied for the Federation Merchant Marine as it seemed to be the best opportunity for employment and professional development, despite his reluctant views on the Federation as a former enemy of Cardassia. Service Record Born: 2359, Cardassia Prime, Cardassian Union. 2364 - 2375: Educated at Military School 233 of the Cardassian Fourth Order. 2376 - 2378: Studied Starship Engineering at Cardassian Military Academy. 2378 - 2386: Assigned to cruiser 'Imtar' as engineering officer, receives 3 citations for dedication to duty under fire. 2386: Demobilized under the Service Limitation Decree. 2386 - 2388: Civilian contract as engineer for Blue Star Cargo Service. 2388: Applies & accepted into Federation Merchant Marine. Assigned SS Star of India, appointed Chief Engineer and Second Mate with rank of Lieutenant.